The wisdom of crowds degenerates at speed into unwise slander and lies. Who’d have thought the Great British Bake-off could result in such vitriolic bile towards contestants that this year’s bakers have been warned not to take part in ‘negative exchanges’ on social media and advised not to ‘read, engage or focus’ on any comments on their performance. After all, it’s only cake. Er nerr – the truth is baking doesn’t get more complex than this. #GBBO14 is much more than ingredient alchemy. If the adage ‘no such thing as bad publicity’ is true, then even the nasty Twitter Trolling is part of a bigger picture which includes generating publicity which feeds into potential book deals, celebrity status and stashes of cash – all for avoiding soggy bottoms and burnt bits. Social media gives you a voice at the end of your fingers; tap, touch, swipe and you’re on Twitter, squeezing insults into 140 characters or less or setting up Facebook pages where personal, biased opinions, can be sieved, shaken or stirred. 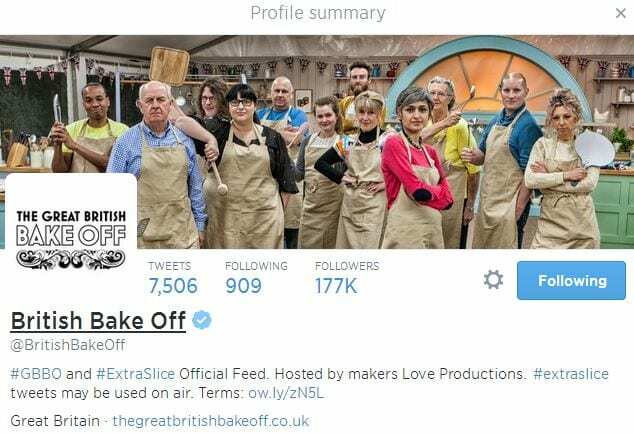 Say what you like online about the Great British Bake Off and large numbers do. The GBBO Facebook page has 404,916 likes – and rising – while @BritishBakeOff on Twitter is followed by 177K and more by the hour. This year includes the spin off show An Extra Slice which extends the pleasure or agony – depending on your views – as well as offering another twitter hashtag #AnExtraSlice. Here’s a show about a show. With a live audience and celebrity panel it’s stretching the brand. With photographs from viewers and contributions from audience members, it was cake, cake and more cake all the way home. A 30 minute bricolage of bake-related innuendo, clips from GBBO programmes (some you’d seen, some you hadn’t) and gender stereotypes stretched to their edge, it proved you can have too much of a good thing. For me the extra slice was one too many. It’s sad to think social media has to come with warnings. Like calls on the news this week for wine bottles to carry messages about the dangers of alcohol and harmful effects of drinking. How much difference does it really make when abstinence is the only safe direction. Yet withdrawing from social media is not a practical answer; it has to much value for us to disconnect. The worry is taking steps to stay safe online and construct appropriate digital identities is not enough to protect from abuse as shown by the experiences of GBBO’s Ruby Tandoh in series 4 and Claire Goodwin from series 5 last week. The online trolls are massing and the remaining GBBO bakers will be the target.